Og nej, jeg kendte ikke til ham her: Adolf Wölfli. Men han er bestemt interessant og værd at stifte nærmere bekendtskab med. Straks jeg ser hans billeder, får jeg associationer til begrebet 'formkonstant', et begreb jeg har trukket på nogle gange i forbindelse med udlægningen af de bagvedliggende mønstre som delvist og sikkert ubevidst har styret en lang række kunstneres stærkt ekspressive billedsprog, blandt andre den danske Jens Lund og mange af hans samtidige jugendstilkunstnere. 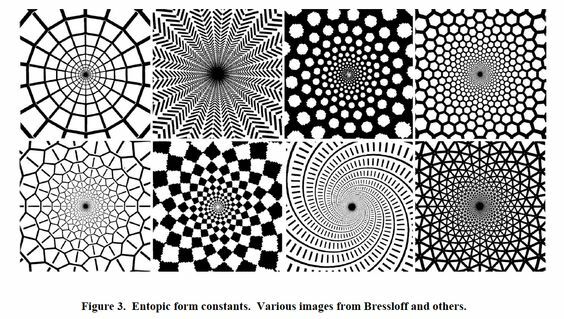 A form constant is one of several geometric patterns which are recurringly observed during hallucinations and altered states of consciousness. 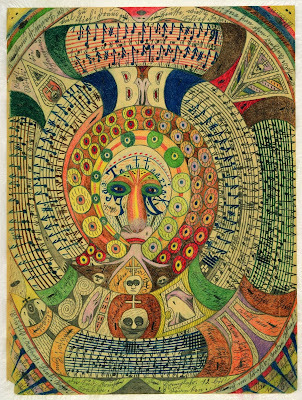 In 1926, Heinrich Klüver systematically studied the effects of mescaline (peyote) on the subjective experiences of its users. 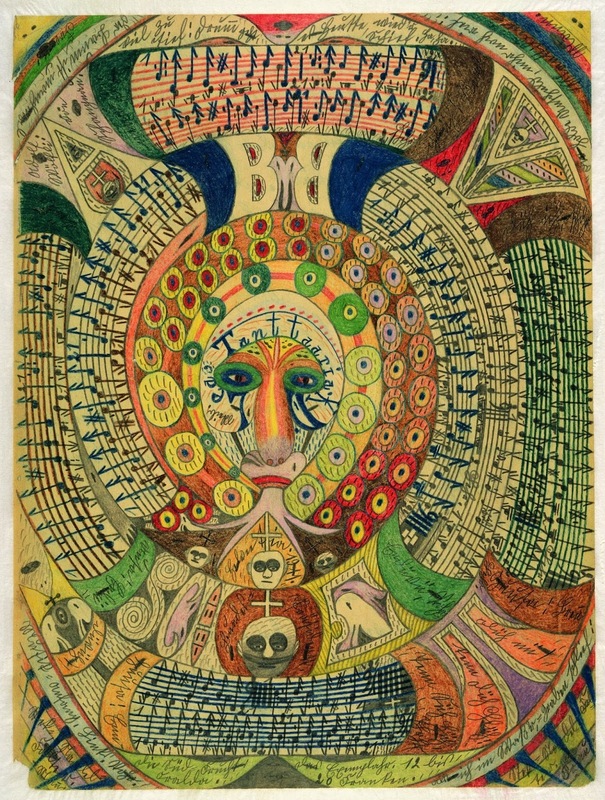 In addition to producing hallucinations characterized by bright, "highly saturated" colors and vivid imagery, Klüver noticed that mescaline produced recurring geometric patterns in different users. 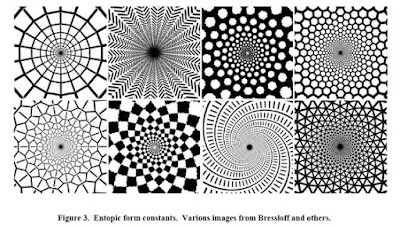 He called these patterns 'form constants' and categorized four types: lattices (including honeycombs, checkerboards, and triangles), cobwebs, tunnels, and spirals. Det centrale her er de to fænomener der indgår i definitionen: "hallucinations" og "altered states of conciounsness". Hvad er det for noget? A hallucination is a perception in the absence of external stimulus that has qualities of real perception. Hallucinations are vivid, substantial, and are perceived to be located in external objective space. 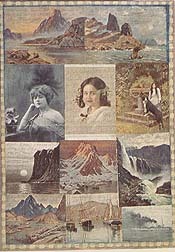 They are distinguishable from these related phenomena: dreaming, which does not involve wakefulness; illusion, which involves distorted or misinterpreted real perception; imagery, which does not mimic real perception and is under voluntary control; and pseudohallucination, which does not mimic real perception, but is not under voluntary control. Hallucinations also differ from "delusional perceptions", in which a correctly sensed and interpreted stimulus (i.e., a real perception) is given some additional (and typically absurd) significance. Og 'anderledes' - 'ændrede' - bevidsthedstilstande? The term "altered state of consciousness" was introduced and defined by Ludwig in 1966. An altered state of consciousness is any mental state induced by physiological, psychological, or pharmacological maneuvers or agents, which deviates from the normal waking state of consciousness. Some observable abnormal and sluggish behaviors meet the criteria for altered state of consciousness. 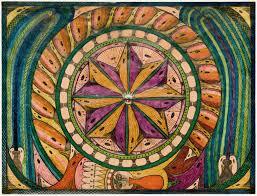 Altered states of consciousness can also be associated with artistic creativity or different focus levels. They also can be shared interpersonally and studied as a subject of sociological research. Principielt er Adolf Wölfis billeder som jeg har vist ovenfor, et udtryk for en 'alternativ bevidsthed', altså udtryk for forestillinger fra "en anden verden", og stort set uden referencer til en ydre realistisk og naturalistisk virkelighed..
Og det synes jeg straks man (jeg) fornemmer. Form og udtryksmæssigt er det jo slående at billederne er udtryk for 'horror vacui' - angst for det tomme rum - billedefladens mønstrede former er ekstremt detaljeret udfyldt, hvad man også kender fra islamisk kunst og fra jugendstilen. Jeg får associationer til visualiseringer af de fraktale formler. Og til fx Hilma af Klint. Adolf Wölfli, born in Bowil (Switzerland) in 1864, had a rough childhood: his father, a stone sculptor who drank away all of his paychecks, abandoned his family in 1872. Adolf and his mother were sent to farms as laborers, but she died shortly thereafter. From then on, the young boy wandered from family to family, sometimes being treated harshly yet still managing to continue his studies. Disappointments in love affected him greatly and affected his development. In 1890, he went to prison after two attempted rapes; five years later, a third one provoked his internment at the psychiatric ward of Waldau near Berne, where he died in 1930 of stomach cancer. 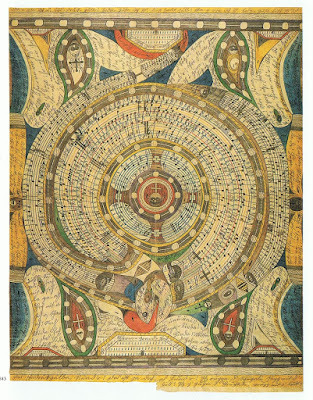 Starting in 1899, Wölfli delved into the depths of creation and elaborated a universe as personal as it was complex, narrating the epic of St. Adolf II. 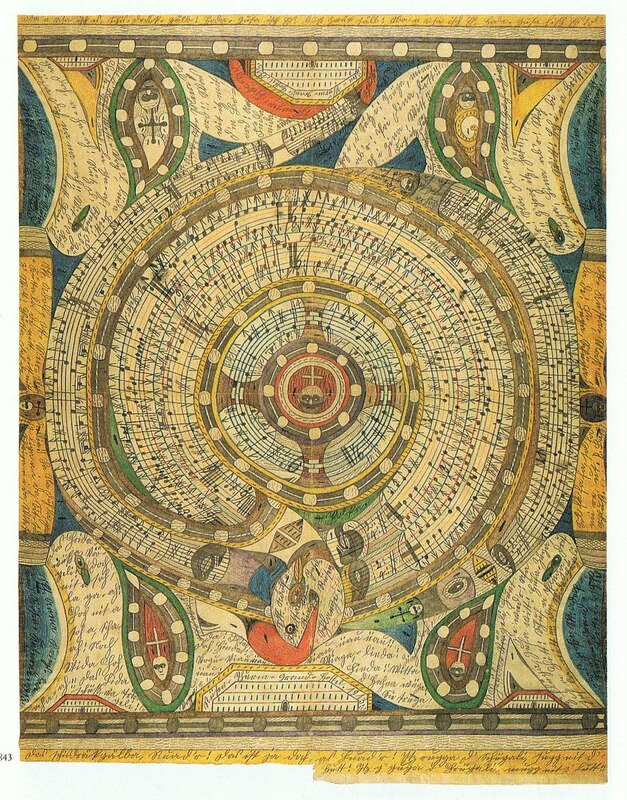 In it, he reinvented his past and projected a utopic future in which St. Adolf II colonizes the universe up to the furthest reaches of space, an inordinate universe that obliged Wölfli to augment the numerical system by multiple units, the highest of which was called anger. 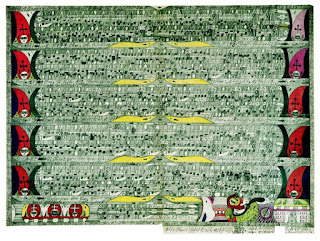 To celebrate this advent, drawings, writings, collages and musical staves were put in dialogue in a proliferation of 25,000 pages. 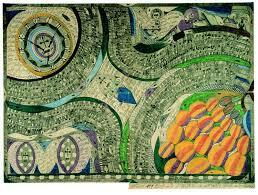 The psychiatrist Morgenthaler dedicated a work to him in 1921: A Mentally Ill Man as Artist. Many artists and collectors were interested in his work during his lifetime: Wölfli thus agreed to sell them “Brodkunst,” which he made specifically for the occasion. 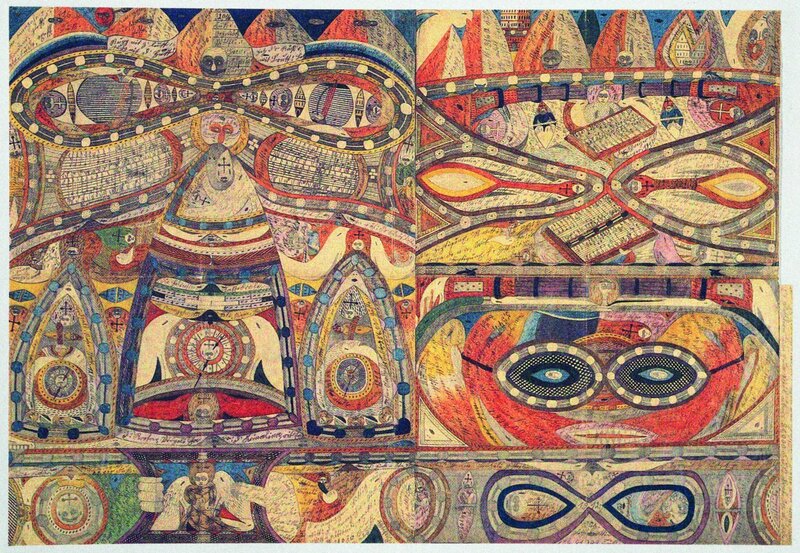 Rediscovered by Jean Dubuffet in 1945, this monumental work enjoys international recognition. Surely it fascinates through its rare capacity to “defy our way of thinking and fundamentally modify our vision of the world” (D. Baumann). Adolf Wölfi havde altså en i den grad nådesløs barsk barndom, med tab af forældre og sociale og mentale rødder i virkeligheden der aldrig blev etableret. En regulær taberhistorie, men en af dem som jeg tidligere har dokumenteret og beskrevet, somme tider indeholder kimen til ekstrem kreativ produktivitet. Adolf Wölfi var voldtægtsforbryder og sad i fængsel i flere år. Og det meste af sit liv fra 1895 og til sin død i 1930 var han tvangsindlagt på et sindssygehospital i Waldau nær Bern. Og i perioder sat i isolation. Sådan så han ud - man fornemmer godt nok at han ikke er helt normal, men altså ifølge kilderne 'gal' i god gammeldags forstand. Diagnosen var den gang 'skizofreni'. Han havde hallucinationer, var voldelig og svær at styre. 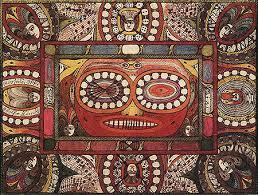 The images Wölfli produced were complex, intricate and intense. 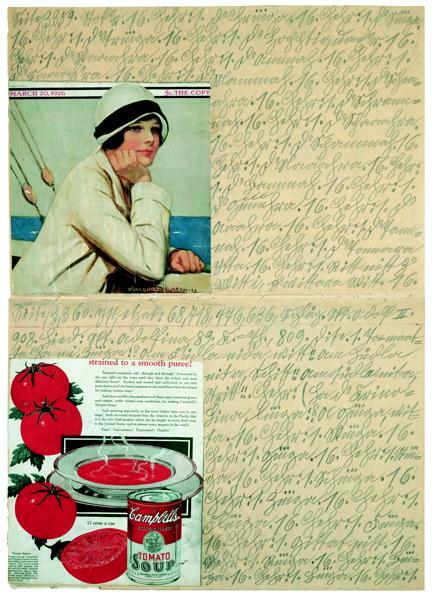 They worked to the very edges of the page with detailed borders. 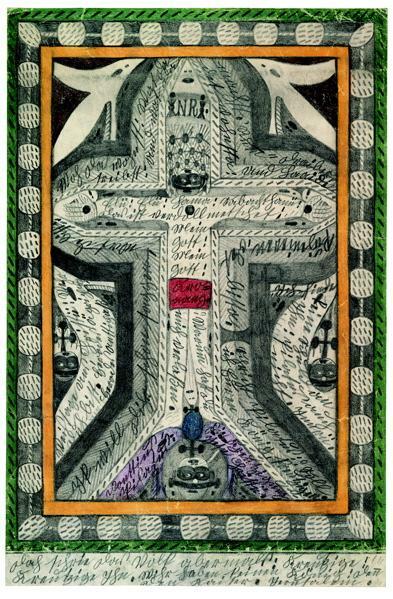 In a manifestation of Wölfli's "horror vacui", every empty space was filled with two small holes. Wölfli called the shapes around these holes his "birds." Og hans liv og multimedie-produktion har sin egen hjemmeside, forvaltet af Adolf Wölfli Foundation, Kunstmuseet i Bern, Schweiz. Her får man i detaljer beskrevet både hans liv og hans utrolige værk: en fiktiv og fantasi-drevet, stærkt fabulerende 'selvbiografi' på 25.000 sider, illustreret med tegninger og collager og sat i musik af ham selv. 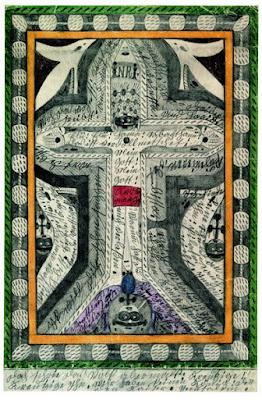 En af de psykiatere som havde Adolf Wölfli under lægeligt opsyn og 'behandling' over en årrække, Walter Morgenthaler, udgav altså i 1921 en bog om ham: "A Mentally Ill Man as Artist" ('en gal mand som kunstner'), et skrift som vist nok var det første faglig seriøse værk der beskrev en indlagt sindsyg mands skrevne og visuelle produktion som KUNST. 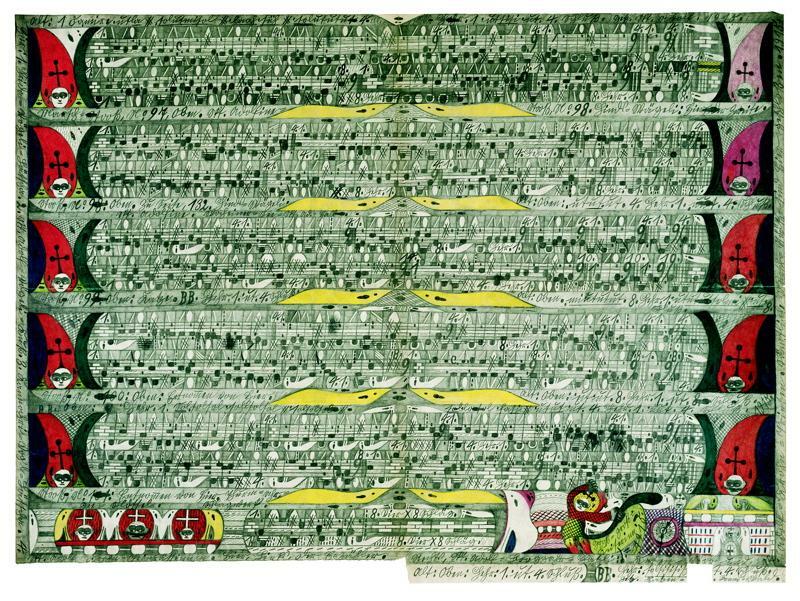 "Every Monday morning Wölfli is given a new pencil and two large sheets of unprinted newsprint. The pencil is used up in two days; then he has to make do with the stubs he has saved or with whatever he can beg off someone else. 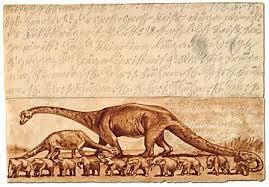 He often writes with pieces only five to seven millimetres long and even with the broken-off points of lead, which he handles deftly, holding them between his fingernails. He carefully collects packing paper and any other paper he can get from the guards and patients in his area; otherwise he would run out of paper before the next Sunday night. At Christmas the house gives him a box of coloured pencils, which lasts him two or three weeks at the most." Bogen medvirkede til at Wölfli blev internationalt kendt og anerkendt som kunstner - selv om han altså stadig til sin død var indlagt på sindssygehospitalet. Og han begyndte i den periode at producere billeder direkte til salg, som han selv kaldet "brødkunst". I og med han blev kendt i en kunstengageret offentlighed, fik han stor betydning, både for en række af samtidens store og anerkendte kunstnere, men også for en senere eftertids kunstopfattelse. Adolf Wölfli fik ny betydning og kunsthistorisk anseelse via den franske kunstner Jean Dubuffet der allerede i 1920´erne var blevet fascineret af hans billeder gennem Walter Morgenthalers bog, og som efterfølgende var begyndt at samle på billeder af ham. 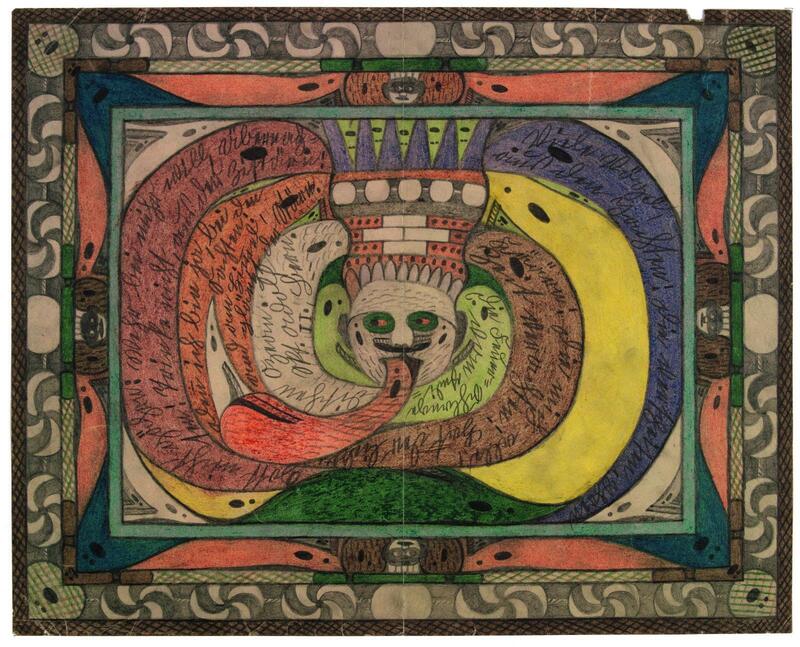 Sammen med en række andre kunstnere: Jean Paulhan, Andre Breton, Charles Ratton, Michel Tapie og Henri-Pierre Roche, dannede han i 1948 'La Compagnie de l'art brut' i Paris, en sammenslutning som var dedikeret til "opdagelse, dokumentaiton og udstilling af 'rå kunst'". 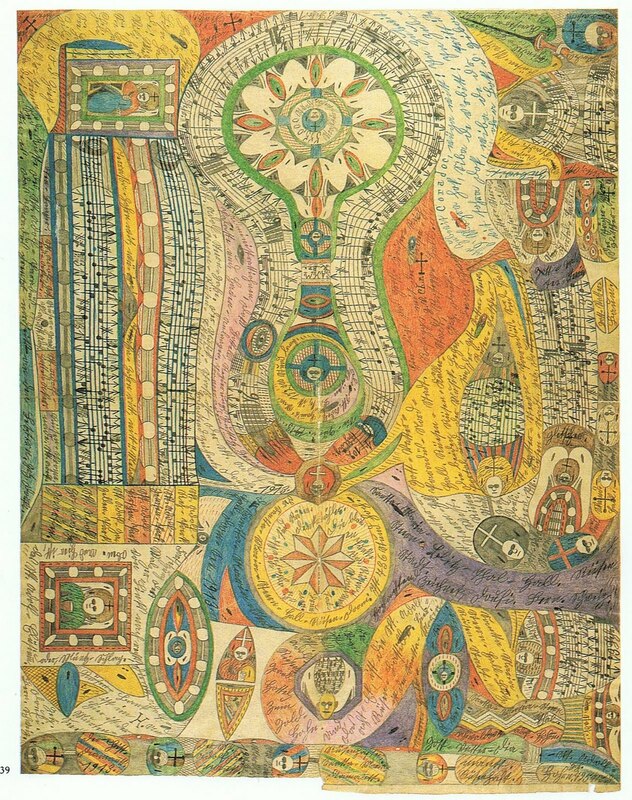 Dubuffet erhvervede sig efterhånden en stor samling af den slags kunst, blandt andet med mange værker af Aloise Corbaz og Adolf Wölfli, en samling som nu har til huse i 'Collection de l'art brut' i Luzern. Those works created from solitude and from pure and authentic creative impulses – where the worries of competition, acclaim and social promotion do not interfere – are, because of these very facts, more precious than the productions of professionals. 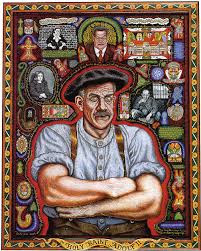 After a certain familiarity with these flourishings of an exalted feverishness, lived so fully and so intensely by their authors, we cannot avoid the feeling that in relation to these works, cultural art in its entirety appears to be the game of a futile society, a fallacious parade. ... billeder og andre visuelle udtryk, skabt af bl.a. børn, mentalt forstyrrede og andre uden kunstnerisk skoling. 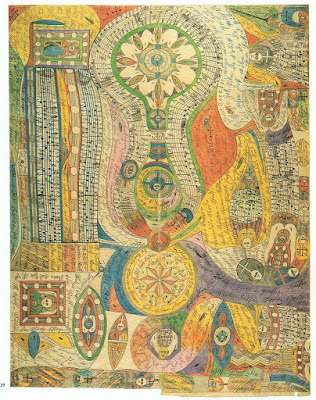 Ligesom surrealisterne og Cobrabevægelsen fandt Jean Dubuffet her kunstens ægte råmateriale, som han stillede op imod den akademisk skolede kunst. Jeg kan helt oplagt også associerer til Paul Klees billeder og tænkning. 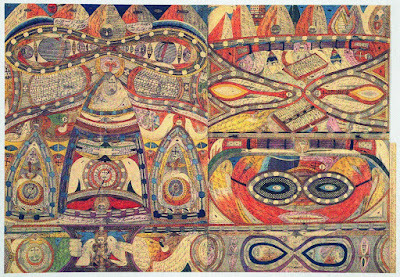 The term 'outsider art' was coined by art critic Roger Cardinal in 1972 as an English synonym for 'art brut' (French: "raw art" or "rough art"), a label created by French artist Jean Dubuffet to describe art created outside the boundaries of official culture; Dubuffet focused particularly on art by those on the outside of the established art scene, such as psychiatric hospital patients and children. Også Adolf Wölflis musik er idag højt anerkendt i det internationalt morderne musikmiljø - i det omfang man har kunnet dechifrere hans privat nodenotation. Musik og rytme er måske den inderste nøgle til hans værk - og han kan meget vel have været en regulær naturlig (multi)synæstetiker (jfr. 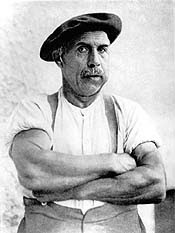 Martin Bigum). 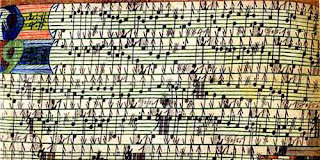 Parts of the musical manuscripts of 1913 were analyzed in 1976 by Kjell Keller and Peter Streif and were performed. These are dances - as Wölfli indicates - waltzes, mazurkas, and polkas similar in their melody to folk music. How Wölfli acquired his knowledge of music and its signs and terms is not clear. He heard singing in the village church. Perhaps he himself sang along. 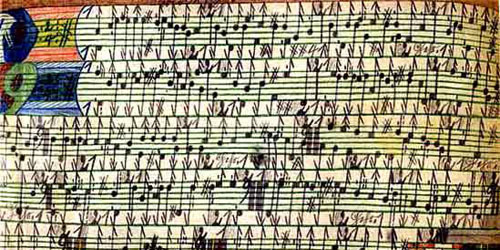 There he could see song books from the eighteenth century with six-line staffs (explaining, perhaps, his continuous use of six lines in his musical notations). At festivities he heard dance music, and on military occasions he heard the marches he loved so well. 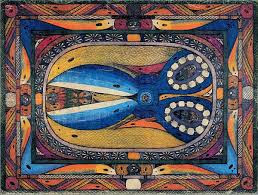 More important than the concrete evaluation of his music notations is Wölfli´s concept of viewing and designing his whole oeuvre as a big musical composition. The basic element underlying his compositions and his whole oeuvre is rhythm. 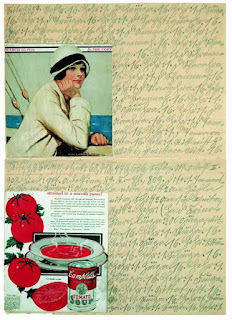 Rhythm pervades not only his music but his poems and prose, and there is also a distinctive rhythmic flow in his handwriting. Nørgård mødte Wölflis værk ved udstillingen Outsidere på Louisiana i 1979. Efter tredje symfoni (1975) bliver Nørgårds værker mere konfliktfyldte og polaristiske - tænk for eksempel på Seadrift¹s to satser: Being together og Torn apart, hvor de to poler harmoni og konflikt allerede er udtrykt i titlerne - og hvor Nørgård ikke bruger uendelighedsrækken. Wölfli har i sit værk givet udtryk for noget af det, Nørgård i de år søgte efter: Hvordan skabe sammenhæng mellem harmoni og kaos, to yderpoler, der udelukker hinanden? I Wölflis værk afbrydes harmonien - eksempelvis den muntre rejse - af et pludseligt kaos-indbrud - faldet - for derefter at blive genetableret, men dog på en sådan måde, at man aldrig ved, hvornår det næste indbrud sker. Wölflis tekster ligger til grund for flere af Nørgårds korværker, og i operaen Det guddommelige Tivoli har komponisten sat scener fra Wölflis reale og imaginære liv i musik - som en hilsen 'til en bror'. Wölflis person er som et symbol for det polaristiske og det absurde, der også har plads i Nørgårds musik. 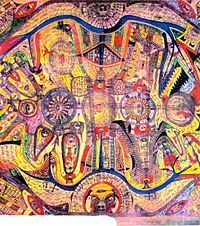 Jeg vil i senere indlæg komme ind på andre kunstnere i Art Brut-grupperingen.